Criticisms that I would level at the design (please don't take these personally as these are meant to be constructive and help you with future projects) is that at the front of the vehicles the crew compartment has windows but no doors for the crew to get in or out. Also it seems to have far too many wheels. Unless this vehicle is incredibly heavy I would take off a number of wheels and spread them further apart. The last thing I noticed straight away is that the radar itself looks featureless and too thin to actually be a radar antenna. Otherwise I would say it was a very interesting idea. I think if I was designing such a vehicle now I would probably use a four faced AESA design on a fixed structure. With no moving parts it will be simpler and cheaper, yet in operation you have all directions covered and can scan in any direction electronically simultaneously. To match that performance I would add a few EO ball turrets for ID purposes. To defend the vehicle I would attach the vertical bin launchers of the SA-15 SAM system that would take target data from the main radar array and the EO turrets and give 360 degree SAM coverage. The advantage of the SA-15 over the SA-19/-22 is that the vertical launch missiles of the former are ready to engage targets from any direction without needing to turn a turret... assuming the main array can perform search, tracking and guidance functions. Just using the main array also reduces the chances of interference in combat while searching for targets and transmitting that target data to the network while engaging threat targets close to the vehicle. With the AESA radar LPI modes can be used to minimise risk. Very nice model... thanks for sharing. BTW after reading my comments how might you want to improve it? Perhaps adding Morfei missiles in vertical launch tubes using lock on after launch fire and forget missiles would allow large numbers of threats to be dealt with more rapidly? Thanks for the comments, I didnt do my referencing well hence many things that looked...out of place ><. Well I don't have any hard evidence, but I suspect the frontal hull armour is of a very steep sloping angle to maximise its protection performance, the turret is unmanned with an external 125mm gun with the ammo in an autoloader below the turret ring, and I suspect an independently elevating 30mm cannon is also fitted to the turret with ammo also likely stored below the turret ring. The tank will have a rear mounted engine, while the troop transport (APC and IFV) will have front mounted engines and large ramp rear doors. Well, my own intepretation of the T-99 Armata, in what I like to call the T-125 behemoth for some reason, cos its some idea which I wanted to do for some time, is essentially a lengthened chassis of the T-90, so supporting 7 road wheels instead of the 6. The unique feature will be the turret, sporting probably something similar to the T-95 turret, but maybe with a longer bustle. Possible additions include perhaps vertically launched missiles similar to that on the TOR-M1, but using iglas instead due to space restrictions. With the Black Eagle upgrade of the T-80U tank they lengthened the hull to allow a more heavily sloped front hull armour arrangement, and the designers at OMSK that worked on it and its turret bustle autoloader went to UVZ with their patents. I have read that the Burlak upgrade for the T-90 used the combination of the fully automated rear turret bustle autoloader of the Black Eagle together with the proven underfloor autoloader of the T-72 series to separate the ammo from the crew compartment while allowing main gun ammo to be 53 rounds (22 in the autoloader and 31 in the turret bustle). AFAIK the Russian Army deemed the rear turret bustle ammo storage as too vulnerable to enemy fire and rejected it. Having said that the idea of a drop in auto loader unit on the back of the turret with straight ramming design/operation has the benefit of rapid reload (old mechanism removed like an empty rifle magazine and replaced in a rear area using a crane to fit a full autoloader. Another advantage is longer penetrators could be used, and the purpose is just to increase ready to use ammo capacity. Its vulnerability is no longer important as if hit or if it catches fire the turret could be turned 90 degrees from the front and the autoloader could be jettisonned before the fire turns into an eruption and the vehicle still has underfloor ammo to continue the fight. The turret bustle ammo could be considered extra ammo that is still ready to use. Regarding vertical launch SAMs you would need upgraded Iglas... there is talk of a new IIR guided MANPAD being worked on called Verba, which if made a lock on after launch weapon could do the job you envisiage. Otherwise there is always Morfei which will be a vertical launch IIR guided lock on after launch weapon used as a short range Archer replacement and also in the Army and Navy as a short range SAM and naval CIWS like SAM. oops, the turret i meant was the BLack Eagle turret, not the T-95. well, this vehicle im modelling atm, sitll far from complete, well, the idea was for a need of a vehicle that was adept at fighting in the wide open plains. With the various mid eat conflicts, the russians confirmed that the greatest threat to a tank was not another tank, but shoulder mounted ATGMs as well as ground attack helicopters. 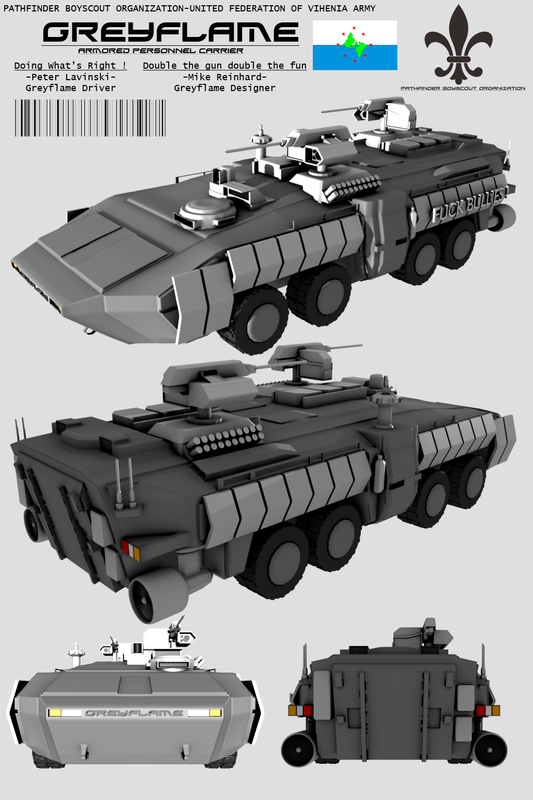 Therefore the project "T-125" was created as a continuation of the T-99 Armata. While the T-99 served as an MBT, the T-125 served more as a mobile howitzer/TD, serving the needs similar to ISU-152's in the great patriotic war, capable of absorbing damage and delivering plenty of firepower to focus on encampments as well fortifications, as well as guarding the troops from enemy heli fire. Actually the ISU-152 was just direct fire artillery, and was not really heavily armoured. They tended to sit back a little and fire down open sights at hard points like heavy bunkers. Putting a 152mm artillery vehicle in that modern role would not really be that useful. The modern equivalent of the ISU-152 is probably the BMP-3 with its 100mm rifled main gun for direct fire delivery of HE that most modern IFVs lack with their light automatic cannon armament. I suspect that at some stage a 120mm version of the 100mm shell of the BMP-3 will be developed and the 120mm can be universally adopted as mortar and direct fire gun for Russian armour... such a weapon is the thing I would like to add to the BMPT design to give it direct fire HE firepower. Because the BMPT has a manned turret the 120mm rounds and mortar shells and guided missiles would need to be stored externally in a turret bustle, but an externally mounted 120mm mortar should have a much better range of angle for firing. I would replace the two 2A42 30mm cannon with a single twin barrel GSh-30K cannon taken directly from an Mi-24, as its low rate of fire would be fine for most ground targets while its high rate would also be good for use against aircraft. It is related to the twin barrel cannon used in the Tunguska/Pantsir-S1 systems. Hmm and playing a bit. This is an 6500 Ton frigate..armed with 10 P-800 missiles. The AAW suites is S-300F-M with 4 face phased array radar on topmost of the mast.. below it there is an S-band multimode Radar. Hmm i wonder whether Russia will make use of such configuration. Cost is higher that 360 deg rotating antenna..but improved data-rate for missile guidance and reliability will likely worth the costs. 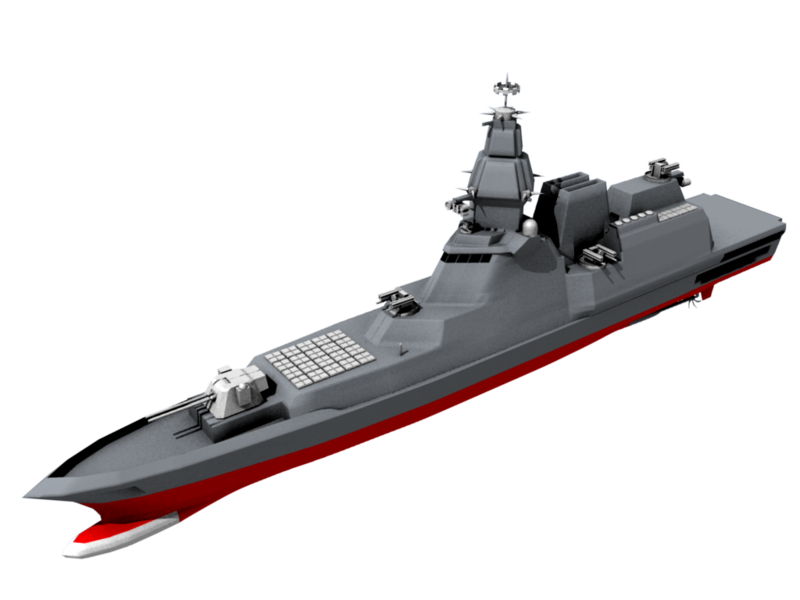 A 6,500 ton vessel should have at least a 130mm gun mount... something like the A-192 (stealthy lightweight replacement for the AK-130. BTW to be mr picky... your R-27s should be called R-27Es as they use the enlarged R-27E rocket motor models. 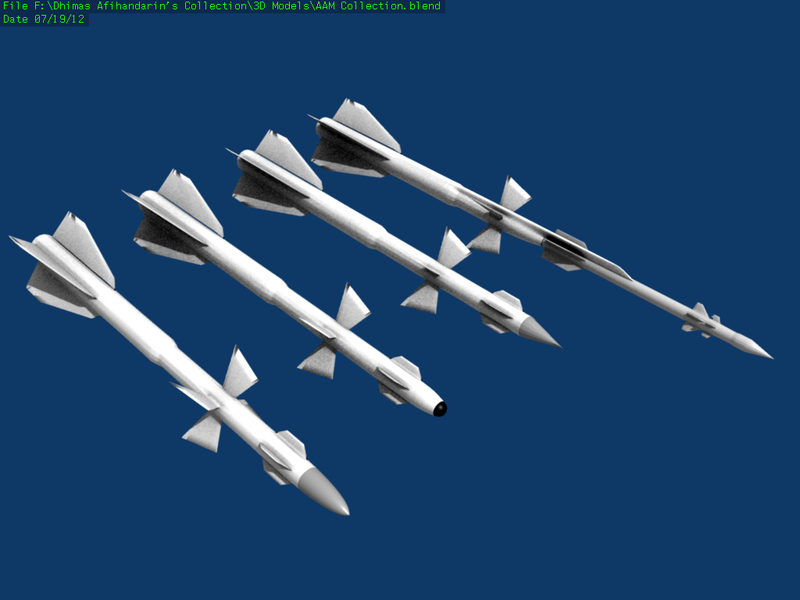 I would recommend that a useful addition would be two two stage missiles with R-73s mounted on the fronts of R-27 missiles. Check out the photo revealed of the model for the new 152mm Russian Naval gun... it looks like an enlarged A192 which is a stealthy 130mm gun used by the navy. haha @ this guy " I live there! ".....yeah right. Some people in New Zealand are always whining about how much better it is in Australia... better jobs, more pay, etc etc. For a lot of people the glass is half empty. Having said that, while a lot of things have changed in Russia... it hasn't changed for everyone everywhere in Russia. I would expect small village life has not been transformed in the last decade. Some problems remain and can't be solved overnight, or even in a few years, and money is not a magic problem solver either, though a rich person might say that and a poor person might disagree, some problems simply aren't about how much money the government allocates this year from the budget compared with last year. With the completion of the Armata and coalition projects, Russian Engineers were tasked to come up with a "Breakthrough" Tank, utilising the lessons learned from the development. With a crew less turret, engineers discovered the feasibility of mounting the twin loading system onto that of a gun, and hence the T-125 was born. In order to fit the entire array of weapons, the russians came up with a lengthened chassis with 8 road wheels, which made the T-125 long, but reduced stress on the suspension and still giving it a respectable top speed, with a compromise on maneuvability. The twin 152mm guns were originally intended to be of horizontal layout, but it was changed to vertical layout, so that the ballistic computer can accomodate for both guns easily. The twin guns also gave the T-125 a unique ability, that was lacking in previous russian tanks, which is the ability to adopt the hull down position, which in practice meant the gunner would usually fire from the top gun instead. However, to reduce gun stress, the 152mm guns would fire a slower but heavier round compared to that on the 125mm. Secondary armanents consisted of a 6 barrel 23mm cannon and an independently rotating 40mm grenade laucher on the back of the turret, where engineers learned that in urban fighting, the turret could not turn to engage most targets due to size restrictions. The T-125 would seen be combat tested by the Iranians, against the Iraqi's territorial incursion. It was discovered that the T-125 were to be effective against the Iraqi army's M1a3's, despite the latter being equipped with Active defences, as the Iranians usually fired the heavier 152mm shells in twin volleys against targets, which negated the effect of active defences. In fact, the twin gun layout negated a relatively good rate of fire, which allowed the Iranians to excel in engaging heavy units behind cover. However, although the Iranians liked the tank, the T-125 had some issues, one of them was the size. Due to the cost of the T-125's, the Iranians (buyign 16) usually sent the T-125's on their own, to be supported by other MBT's. The length of the T-125 made a huge silhouette for enemy gunners and AT teams to attack, resulting in some of the T-125's suffering from mobility kills, although not being destroyed. 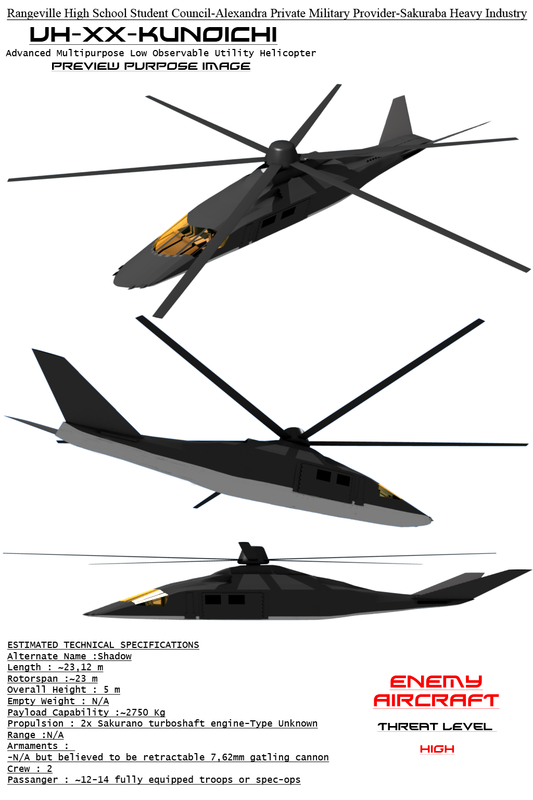 The size also made the T-125 obvious on enemy helo radar, and the Iraqi's spent alot of resources in engaging the T-125s, destroyign them with either a combination of Artillery and Attack Helicopters, since the T-125 was mostly immune to ground fire. At the end of the war, the T-125 has had a powerful reputation against the Arab nations, being called the "Iblis" (Devil). Huh... nice story there and even nicer tank design, very interesting. I have to tell you one thing I've noticed on your design. The wheels are too big and too close to each other. I gave it a lot of thought during my tank design, so I know what I am talking about... I hope you know I don't mean any disrespect to you with this comment. One thing that attracted my attention is the way you thought you can beat the active defense systems with double shot... nice one, not sure if it could work, but a nice idea. As I said, very interesting. Well, when I get some more time, I will post some specs and pics of my tank people. Anyway, some parts might be wrong, since Im not that well versed in the technicalities of well, war machines, but I do enjoy designing them. Come to think of it, your tank seems to be like a modernised Black Eagle variant of the T-64 , longer chassis, redesigned turret, Remote controlled MG. I guess you might be right about your wheels... about that perspective, I might be wrong now that I look at it again. About my tank and its suspension, no, it is not similar to one of T-64 or any other Russian tank, it is something I did myself, but there might be some similarity to western tanks. I did take most of modern MBTs in consideration while making my own design, but I tried to keep everything original as much as I could. I did consider making a tank without the usual turret (making it only what was necessary for the gun), but I dismissed that cause I had to put a lot of toys on the tank and I needed the turret in the end, though it is not a regular turret.